On Sunday morning we travelled to Longreach, a town of a little over three thousand people in a remote part of western Queensland. 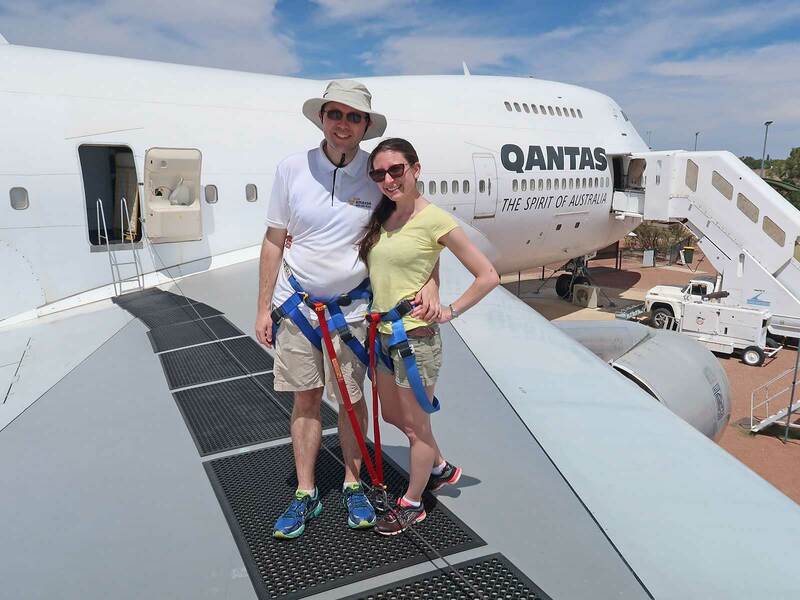 The main reason for our trip was the Qantas Founders Museum, famous among aviation enthusiasts the world over as one of the few places in the world where one can have a really in-depth look at a Boeing 747. Our private tour was led by the museum's curator Tom Harwood, and it was immediately evident that he was enthusiastic, extremely knowledgeable, and enormously patient as we took hundreds upon hundreds of photographs. The schedule included a walk on the aircraft wing, the chance to sit in the cockpit, an exploration of the electronics bay below the cabin floor, a visit to the cargo hold, a close-up look at the mechanics of the rudder, and lots more besides. We were also able to walk on the wing of a 707 in corporate jet configuration. The experience was supposed to last three hours, but Tom stretched things to five when he realised just how interested we were in what we were seeing. Our stay was not without its challenges, as a complete failure of the baggage system at Sydney Airport left us without luggage for thirty-six hours in a part of the world where all local shops close on Sundays and the only place to buy clothing in a fifty mile radius takes a lengthy siesta for much of December and January. That being said, the remarkable friendliness of the local population more than compensated for our travails, with the hotel lending us sunscreen and the lady at the airport giving us each a set of highly fashionable Qantas pyjamas. We had two evenings in town, and spent one having dinner at a local bar and the second at Drover's Sunset Cruise and Show, an interesting experience if not one geared at people under the age of sixty. We also passed a few hours at the Australian Stockman's Hall of Fame, and while the exhibit wasn't all that interesting to me Megan found it fascinating. The museum is in the process of restoring a Super Constellation for its collection, and while I doubt we'll make it back for that I'm hoping that we can return in a decade or two if they manage to acquire an Airbus A380. It occurs to me that the frame that operated QF32 would be a good choice if they can get hold of it! There were two primary reasons for our visit to Australia this year. The first was the Qantas Founders Museum, discussed in some detail in the above travel note. 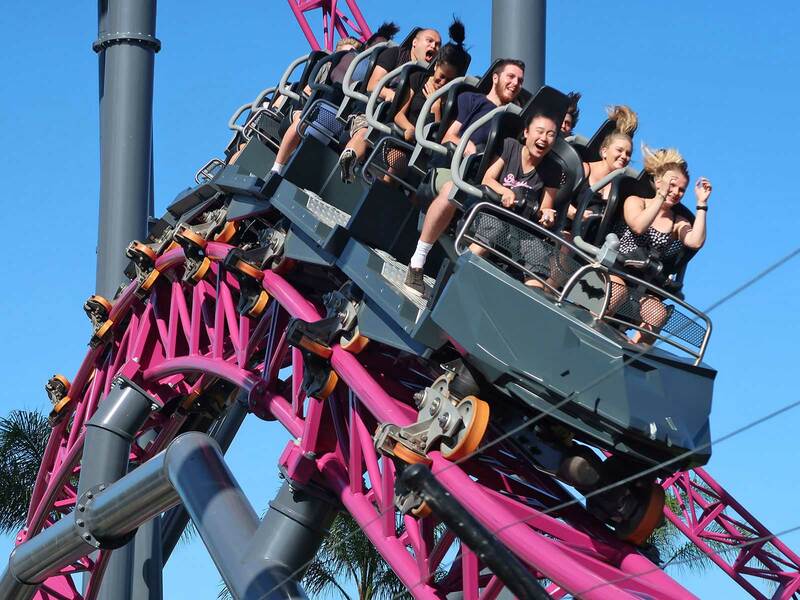 The second was the announcement that Warner Bros Movie World had sunk thirty million Australian dollars into a record-breaking ride from Mack that would take the records for the the tallest, fastest, longest, and most purple roller coaster in the southern hemisphere. As with many large coasters the DC Rivals HyperCoaster (#2406) can be seen from some distance away; during daytime hours the track is visible for miles in all directions, and while it fades into the background at night those driving south on the nearby Pacific Motorway cannot miss the brightly illuminated figurehead at the top of the lift. The new ride has four separate queues, including dedicated routes for single riders, fast track guests, and the rear-facing back row which as of this writing requires an additional payment of $10 per person. Guests for the forward facing seats are assigned to specific rows by an operator, though we asked and were given permission to wait for the front for our first lap. It was a pleasant surprise to find loose object storage available in the ride station, and I particularly liked the way the bins featured rotating compartments allowing simultaneous loading and unloading. It looked to me like the ride should easily operate two trains without stacking, though this wasn't happening today as the operators were chatting with each other for several minutes between dispatches. The wait was still manageable, peaking at around three quarters of an hour, though it could easily have been half that with less faffing about. The ride layout is a bit of a mixed bag. It starts out very well, with a fabulous first drop, airtime hill, and non-inverting loop. The middle portion is sedate in comparison, as the train works its way around thirty seconds of wide turns and gentle drops that are visually impressive but fundamentally lacking in forces, almost as if the designers spent a little too much of their potential energy budget at the beginning. In due course the siesta comes to an abrupt end with a series of powerful (and brilliant) airtime hills that are more than a little reminiscent of Skyrush (albeit without the crushed limbs); I'd argue them to be the finest few seconds of Mack coaster I've encountered over the years. Today the front seat was perfectly smooth, and I could happily have sat in it all day long. Unfortunately the same wasn't true of the backwards-facing seats at the rear of the train, which suffered from a distinctive and unpleasant rattle that reminded me very much of my experience on Hair Raiser. 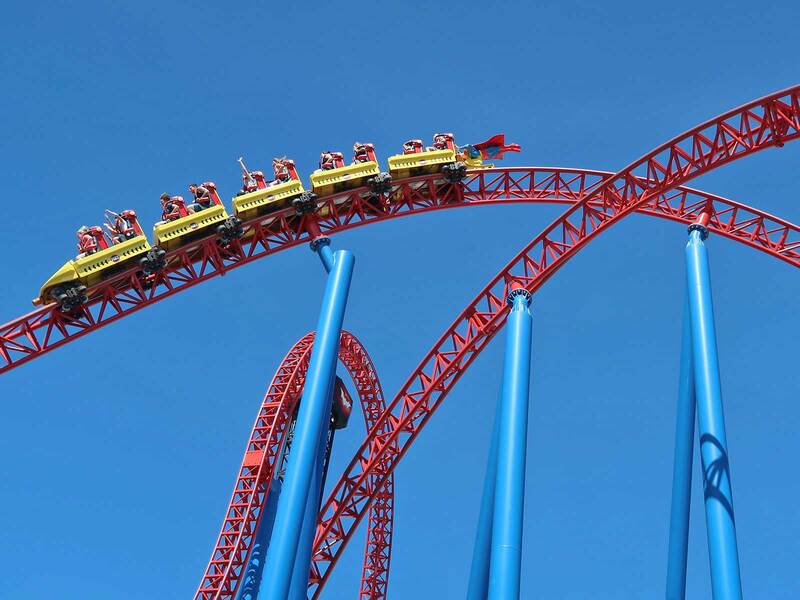 It was certainly thrilling to go through a non-inverting loop backwards, though not entirely comfortable, and the subsequent series of turns shook the train enough to leave me with a mild headache. A forward facing ride in row ten afterwards was even worse, as there was a dramatic and violent thump in the climb out from the first drop that did my ribs no favours. It was only when we returned later in the afternoon that we realised that the wheel seats were the problematic ones; the front half of each car was noticeably better than the rear. We made a quick stop for lunch then headed to the air conditioned comfort of Scooby-Doo Spooky Coaster, a mouse-in-a-box which today was sporting an hour long wait. We'd heard down the grapevine that the interior of the ride building had been stripped out for upgrading, and sure enough our car rolled out of the station into a series of empty frames. The only effect remaining was a pair of swinging axes above the track that looked a little forlorn with nothing else around them. The sound track and dry ice effects in the main room had been switched off, and the only illumination was provided by a series of emergency exit lights running along an upper wall. It was probably wise for the park to have the ride open, given that it was taking a few hundred guests per hour away from other attractions, but it would surely have been better to leave the old theme elements in place until the replacements were ready to go? Our friend James was waiting for us as we disembarked, and the three of us headed over towards Arkham Asylum, a twenty-three year old Vekoma SLC that we'd have skipped today were it not for the fact that the ride can now be experienced with virtual reality headsets for a five dollar up-charge. We knew from our previous visit that the Kumbak rolling stock wasn't as awful as the original, but we were also painfully aware that the experience was a violent one unlikely to be improved by the inability to see upcoming transitions. Nevertheless we decided to give it a go against our better judgment. Our prediction proved to be right on the money; we were able to appreciate the video on the lift hill, but the storyline was quickly forgotten as we concentrated on self preservation. As the train returned to the station Batman appeared on camera and started talking to the Joker, though we heard no sound; presumably that function wasn't working properly today. The mandatory locker policy was still in place on Superman Escape, though it was good to see that these are now free to use for the first hour. The positive surprises continued with a wait time of just fifteen minutes, which James attributed to the purple thing out front. For whatever reason a good chunk of the theming that I remembered was missing here too, not least the water effect on the stairs and the lockers, though the impact was relatively minor given that most of the course is outdoors anyway. The launch was great, though it was too bright for me to keep my eyes open once we hit daylight; perhaps the park will relax its paranoid ban on secured eyewear some day. The only coaster left at this stage was Green Lantern Coaster, still the only El Loco with four-across trains. The ride partially derailed just weeks after our visit in 2015, leading to some design changes, but three years on that incident has faded to a distant memory, eclipsed by the much more serious accident a few miles up the road. On the positive side the alterations have had no obvious impact to the guest experience, which remains superb. The only slight niggle today was that the sound in our car wasn't working, which I'm given to understand is a common problem; it really shouldn't be at this point, given that the manufacturer and park maintenance have had seven years to fully debug the system. We made a brief stop at Alien Invasion 3D, a dark ride that I'm tempted to rename Starfish Invasion due to the distinctive design of its targets. The layout alternated between physical scenery and projections, and both worked extremely well. With that done, we bowed to the inevitable and finished out our day with two final rides on DC Rivals HyperCoaster. Towards the end of our stay in Warner Bros Movie World we learned of the existence of an indoor zip line coaster located in a nearby family entertainment centre, and with no fixed plans for the evening we decided it was worth going to investigate. 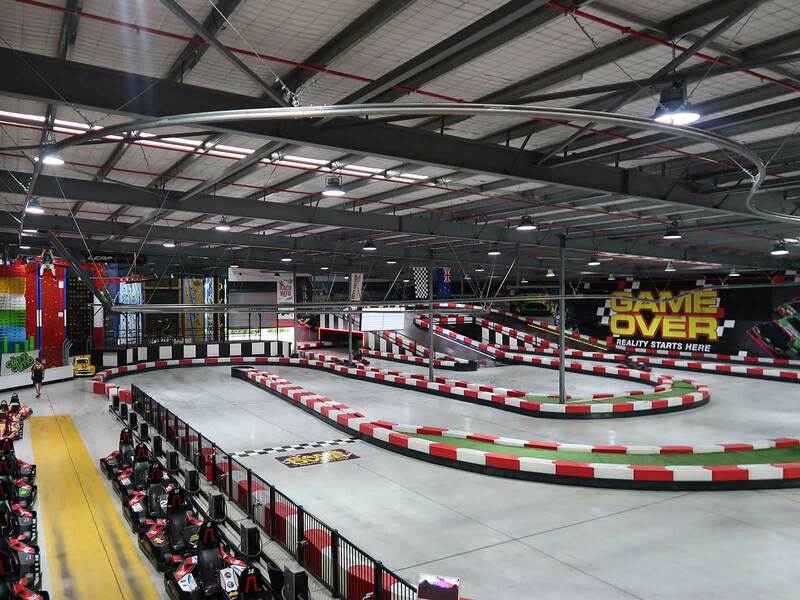 The first thing that caught our eye as we walked through the door was a substantial karting track, and moments later we spotted the Meat Hook above it, occupying around two thirds of the building's ceiling area. Tickets to ride were just $15 per person for two laps. As ever for this type of ride we were required to fill in and digitally sign waivers using nearby computers, though it's worth noting that nobody actually checked the information provided, making me almost sorry that I hadn't picked an alter ego from a movie. The ride is the first zip line coaster I've come across to include a lift hill, in this case a short one stretching roughly twenty feet from the boarding platform to the ceiling. At the apex there is a small drop and climb, followed by a sharp turn to the left. From that point onwards the layout features what is essentially a continuous descent back to the start point punctuated by a few turns and shallow drops. The experience was surprisingly powerful despite its diminutive height and setting, with the only real negative being the low throughput; though two guests were harnessed in parallel, only one could be on the course at a time, and the lift hill was very slow indeed. I estimated the throughput to be around twenty riders an hour at best, which is a long way from optimal even for smaller facilities. Coaster enthusiasts planning this particular hit should probably plan to visit outside of peak times.